VERSATILE: These stools are made of an iron alloy with a cream white finish and a dark wood seat.The extra wooden cushion seat make your room more decoration and stlysh.The stools are elegant enough to be used in a kitchen, strong enough to be used in industrial shops, and durable enough to be used in game rooms, dorms, and bars, just to name a few. 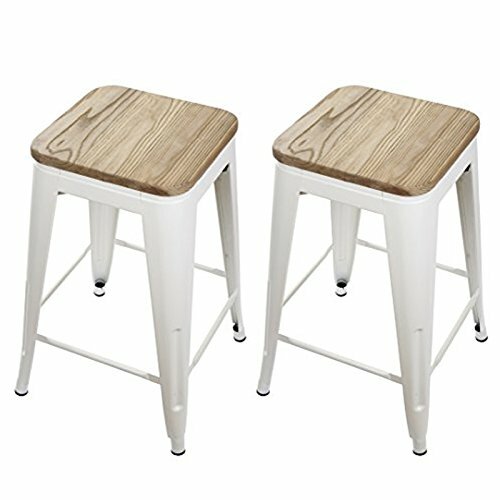 EASY TO STORE: These stools are lightweight and stackable, making them easy to move in and out of storage. The stools can be stacked on top of each other to increase space savings. LOOKS GREAT: The cream white scratch-resistant powder coat is elegant and long-lasting. A stylistic element is introduced with the dark wood seat. The modern industrial look of the stools will perfectly compliment the city chic minimalist, the hard-working machinist, and everyone in between. HIGH STRENGTH: With a weight capacity of over 300 pounds, these stools can support the heaviest of loads. Made from a high-strength iron alloy, these stools are lightweight but extremely durable. Cross braces under each seat adds stability to the stool. Structural ribs pressed within the legs increases their torsional rigidity. MEASUREMENTS: Each stool is 24" tall, with a 12"x12" seat, and a 16"x16" base area for the legs. Sold in a set of 2.